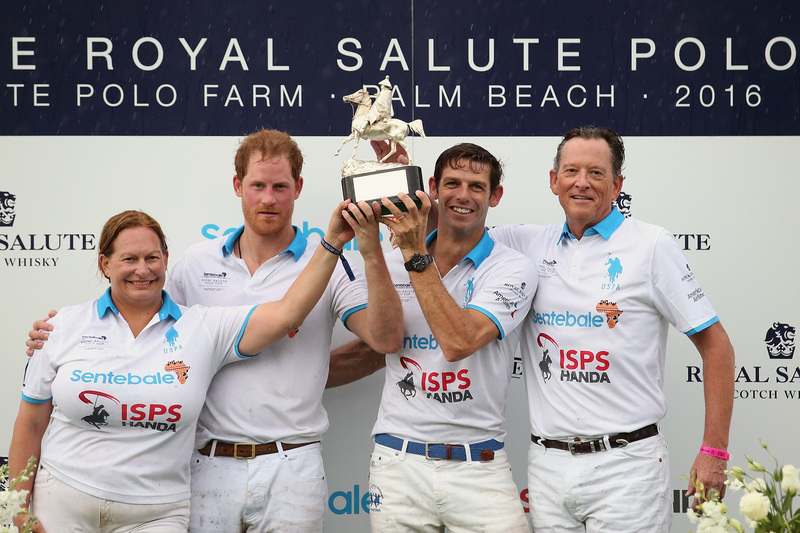 Prince Harry and his team won the grand polo event sponsored by Royal Salute sponsored at the beautiful Valiente Polo Farm in Wellington, Florida in support of HRH Prince Harry’s Sentebale, the charity the prince co-founded that supports young people living with HIV and AIDS in Lesotho, Africa. Royal Salute is an award-winning Scottish whisky produced by Pernod Ricard’s Chivas Brothers. The polo event, which starred Prince Harry himself, raised both much-needed funds for sending 1,500 children and adolescents aged between 10 and 19 years old to Sentebale’s monthly five-day residential camp at the newly opened Mamohato Children’s Center. The belief is that if the children are educated about the virus, they not only learn about their condition but also can educate their peers about the disease, enlightening a generation and leading the way to ending the AIDS epidemic in Africa. Prince Harry competes during the Sentebale Royal Salute Polo Cup in Palm Beach at Valiente Polo Farm near Palm Beach. The event raised money for Prince Harry’s charity Sentebale, which supports vulnerable children and young people living with HIV in Lesotho in southern Africa. The Sentebale Polo Cup, which was held on May 4th, was a round robin tournament involving three teams and twelve polo players, including Malcolm Borwick, the Royal Salute World Polo Ambassador and Sentebale Ambassador Nacho Figueras, also known as the face of Ralph Lauren’s Black Label brand. The Sentebale ISPS Handa team, which was captained by Prince Harry, took home the trophy presented by Royal Salute guest of honor His Grace Torquhil Ian Campbell, the 13th Duke of Argyll. Members of the winning Sentebale team included Melissa Ganzi, Bob Jornayvaz (owner of Valiente Polo Farm) and Borwick. Prince Harry and Royal Salute World Polo Ambassador Malcolm Borwick pose with their team, Melissa Ganzi and Bob Jornayvaz, after competing during the Sentebale Royal Salute Polo Cup in Palm Beach at Valiente Polo Farm in Palm Beach. The event raised money for Sentebale, which supports vulnerable children and young people living with HIV in Lesotho in southern Africa. The Royal Salute team’s roster included Teodoro Calle, Marc Ganzi, Joe DiMenna and Figueras. The Valiente Team was manned by Tommy Kato, Martin Cregg, Curtiz Pilot and professional polo player Nic Roldan. Argentine player Nacho Figueras poses with his team and Royal Salute Brand Ambassador Torquhil Ian Campbell, 13th Duke of Argyll after competing during the Sentebale Royal Salute Polo Cup in Palm Beach with Prince Harry at Valiente Polo Farm in Palm Beach. The event raised money for Sentebale, which supports vulnerable children and young people living with HIV in Lesotho. The event took place at Valiente, one of the finest polo facilities in the world, which is located near Palm Beach and is owned by the Jornayvaz family. Built in 2015, it features world-class polo fields as well as the largest contiguous horse barn in the United States, which was the location of the elegant dinner following the polo competition. At the dinner, Prince Harry addressed the attendees and explained how he had visited Lesotho in 2004 and was struck by the devastating effect the HIV/AIDS epidemic was having on the nation and its children. He explained that two years later, he co-founded Sentebale with Lesotho’s Prince Seeiso in honor of their late mothers, Princess Diana and Queen Mamohato of Lesotho. Sentebale provides vital access to accommodation, care, education and critical psychosocial support for thousands of children and young people affected by the virus. Prince Harry described the recently built Mumahato Children’s Center which is now the center of Sentebale’s operations and how Sentebale’s reach has increased from helping 400 children to 1,500 children each year. “The center would not have been built without the generosity of people like you and events like this—all seven Sentebale polo cups we have done in the past,” says Prince Harry. (For more about Sentebale, Prince Harry, and Sentebale Ambassador Nacho Figueras, click here). Prince Harry competes during the Sentebale Royal Salute Polo Cup in Palm Beach at Valiente Polo Farm in Palm Beach. The event raised money for Prince Harry’s charity Sentebale, which supports vulnerable children and young people living with HIV in Lesotho in southern Africa. The Sentebale Care Giver Initiative offers support, education and advice to grandparents or parents with children suffering from HIV, enabling them to support the youth and combat the myths and stigma associated with HIV. “This initiative provides essential life skills for carers to hopefully pass down to the next generation and to ensure the future of Lesotho for years to come,” added Gallois. Royal Salute, the premium blend whisky produced by Chivas Brothers (a division of Pernod Ricard), has a longstanding relationship with the British Royal family that dates back more than 60 years. Royal Salute was launched on June 2 1953 in honor of Queen Elizabeth II on the day of her coronation. Since then, Royal Salute has supported and sponsored a variety of polo events that have raised awareness and funds for a variety of charitable organizations including Prince William’s Tusk Trust. Polo players, including Royal Salute World Polo Ambassador Malcolm Borwick, Prince Harry, and Argentine player Nacho Figueras, walk off the pitch after competing during the Sentebale Royal Salute Polo Cup in Palm Beach at Valiente Polo Farm in Palm Beach. The event raised money for Prince Harry’s charity Sentebale, which supports vulnerable children and young people living with HIV in Lesotho. The Sentebale Polo Cup is in its seventh year, and for the past six years, Royal Salute has been its title sponsor. ISPS Handa, Valiente Polo Farm, American Airlines, USPA and Merchant Hub also sponsored the event. This was the second Sentebale Royal Salute Polo Cup to take place in the U.S. with the first located at The Greenwich Polo Club in Greenwich, Ct. in 2013. Royal Salute is deeply involved in polo, which is the world’s oldest surviving team sport. Through its Royal Salute World Polo platform, the brand has hosted prestigious polo events across Asia, the Americas and Europe, featuring some of the world’s best polo players. In 2015, it was the title partner of the Royal Salute Coronation Cup in celebration of Queen Elizabeth. Click here to donate directly to Sentebale. Prince Harry, Delfina Blaquier (wife of Nacho Figueras), and Royal Salute World Polo Ambassador Malcolm Borwick attend the Sentebale Royal Salute Polo Cup in Palm Beach at Valiente Polo Farm in Palm Beach. The event raised money for Prince Harry’s charity Sentebale, which supports vulnerable children and young people living with HIV in Lesotho in southern Africa.